Strange things happen in the mind of John Schultz and many times there are some great results from those endless random thoughts. 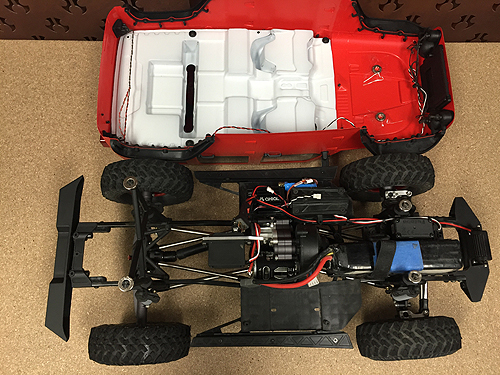 Sure, you may have heard of his epic trail builds at Axialfest, but a recent mind melt session in the Schultz Lab yielded a great how to on setting up your body for a super scale look using magnets to secure the shell. Photos were pinched, helpful tips jotted down and we’re going to pass along the information so you can mount your next body sans body clips. First things first. Don’t drill any body mounting holes in your freshly painted body. 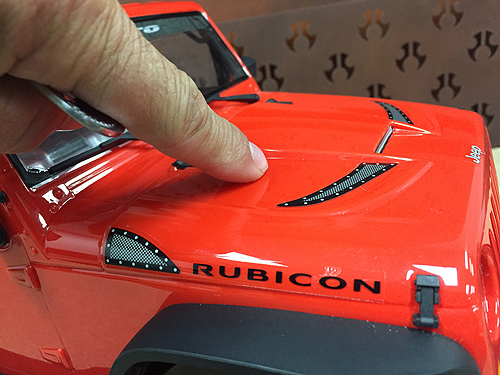 Place the body on your rig and get a feel for where it needs to be positioned. You’ll need to determine where the magnets need to be placed on the inside of the body. There are several ways to do this. Some people put a small dot of paint on the top of the body posts or some black marker so it transfers to the body to designate the body mount locations. 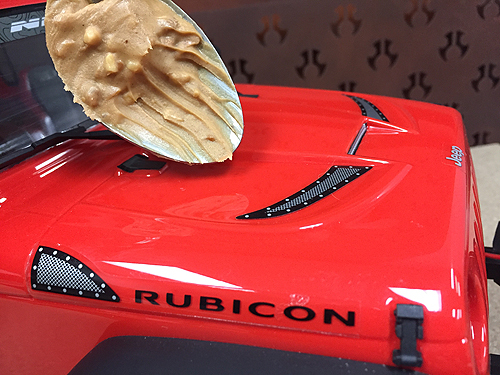 John Shultz uses a dab of peanut butter and then eats the rest of the jar. Some bodies do have dimples molded in the body to identify the mounting points and these can of course be used too. If you do use peanut butter, er um, marker to transfer your body mount points, press down firmly to transfer the “substance” to the body. Now it’s time to find some magnets that can be used to secure the body. 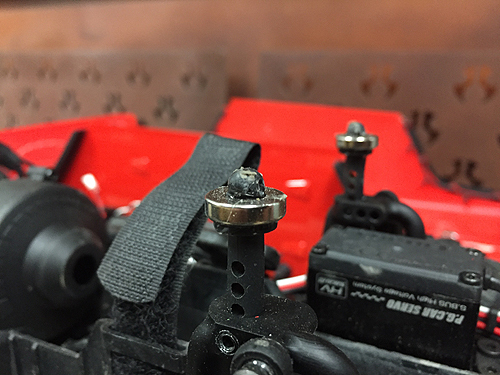 John found these 1/2″ x 1/4″ x 1/8″ Neodymium Ring Magnets that fit perfectly on the SCX10 II body posts. 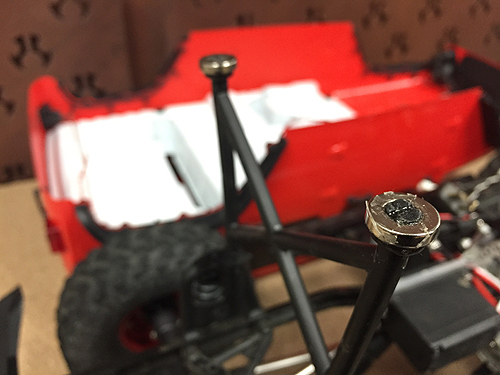 Once you’re satisfied with the fit of the magnets on the posts, place a small amount of 5-minute 2-part epoxy to the base of the body mounts and slide the magnets onto the posts. 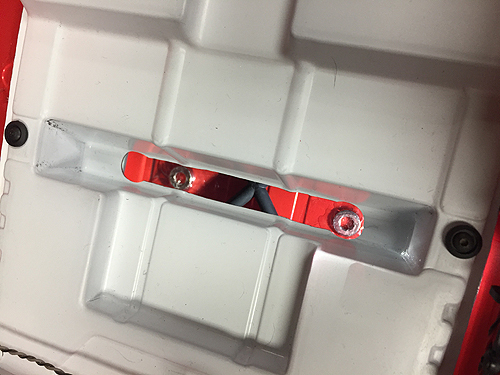 Once the epoxy has cured, use a pair of side cutters to cut the top of the post off so it will allow the magnet, that will be secured to the body, to sit on the post magnet. Now it’s time to secure the magnets to the body. Use the epoxy to secure the magnets to the body. Make certain that the mark you made on the body in STEPS 2 & 3 is in the center of the magnet holes. 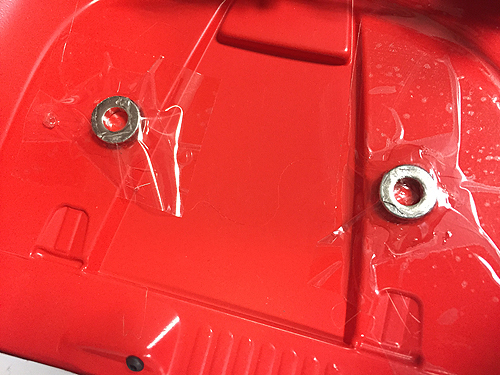 Use some packing tape to help secure the magnets while the epoxy dries. This is a critical step. You don’t want the magnets to move and then the epoxy dries and you have no way to move the mount. 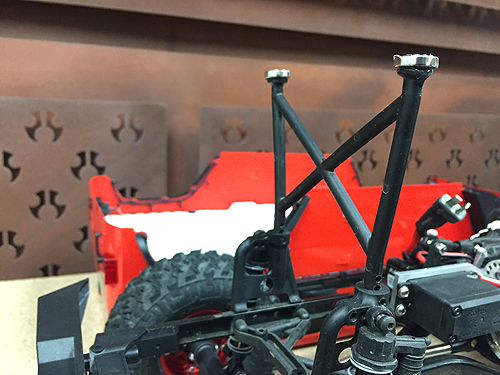 A magnet that moves during this step will most likely result in the body not sitting properly on the chassis. Here you can see the magnets epoxied to the roof which was done prior to John installing his interior. 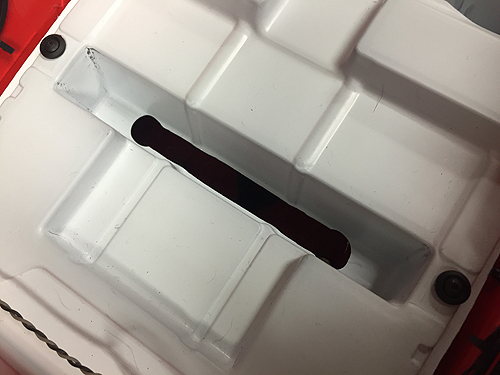 Once the epoxy has dried on all of the magnets, you’re ready to drop the body on your chassis with the ease of magnets holding it in place. 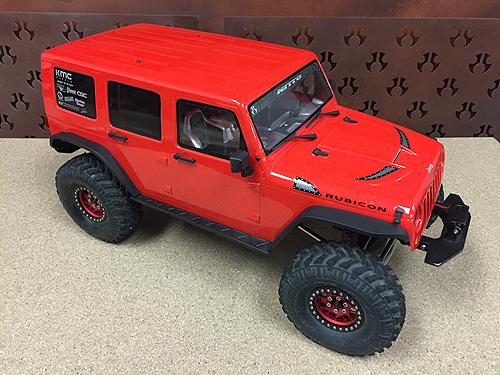 Not only will the body be held firmly in place, but it also looks much more scale without body posts and its super easy to take the body off for battery swaps or turning the truck on and off. 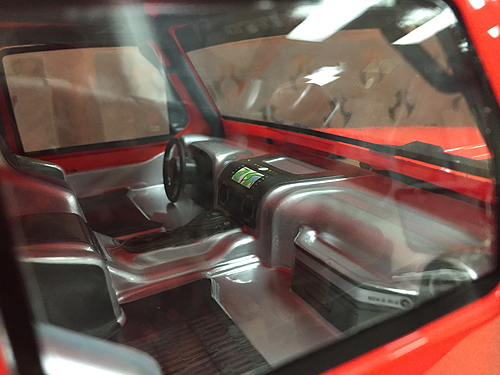 You may have noticed in some photos that an interior was installed in the 2017 Jeep® Wrangler Unlimited CRC body. 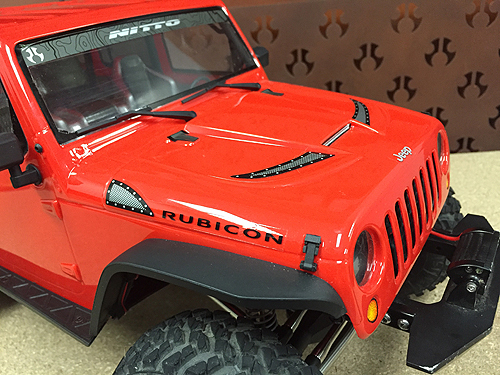 To do this, John took a 2012 Jeep® Wrangler Unlimited Rubicon Body and cut the exterior off, leaving just the interior and roll cage to secure to the new Jeep Wrangler Unlimited body. 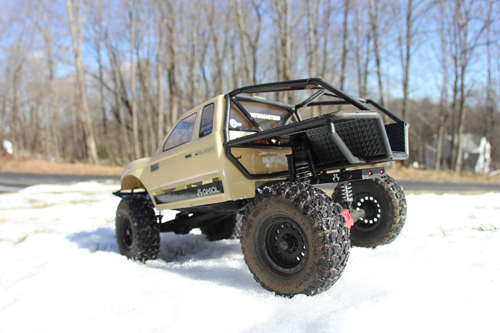 The result of course is a more scale looking rig to hit the trails with. It’s never too early to start thinking about Axialfest. Actually does anyone stop thinking about Axialfest? It can be said for certain that those who have attended Axialfest never forget their time there. 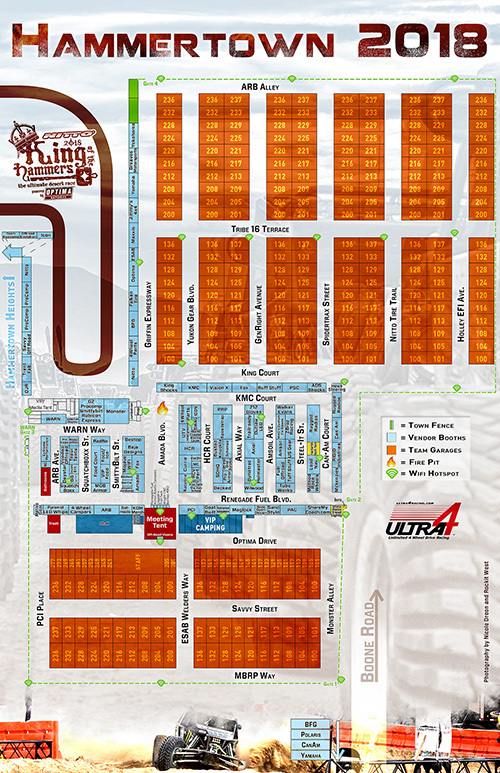 If you’re new to the event, then we can get you right up to speed on what experiences you can have there. You’re about to witness a collection of Axialfest videos produced by people who are truly passionate about the radio control hobby and who are now passionate about what goes on at Axialfest. The collection covers some of the best videos posted to Youtube. Not all of the videos, there are certainly many more amazing videos created by attendees that we urge you to hunt for on Youtube, but the videos selected here will get you ramped up for Axialfest 2018 and beyond. Team AMain Hobbies Presents AxialFest 2017. The crew that attended Axialfest 2017 has put together an amazing presentation of what goes on at the event. Rigs in action, the excitement of the participants the beauty of the setting this video will leave you wanting to see more and attend Axialfest if you don’t already. Axialfest can seem overwhelming for the first time attendee, but here each day’s events are broken down so you know what to expect. The elements of Axialfest evolve each year, but this will help you start your journey. 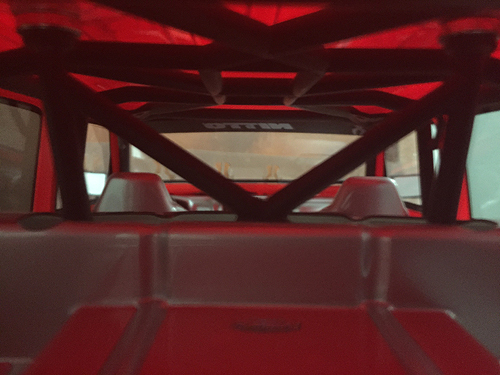 Probably one of the most epic documentary style videos about Axialfest is the 5150 2016 video sponsored by Pro-Line Racing. This finely crafted film gives you the background of Axialfest, what it means to the people that attend it, the grueling terrain both people and Axial rig endure at the amazing grounds of Cisco Grove. Here, you’ll see people come together from all over the world all with one passion, Axial. 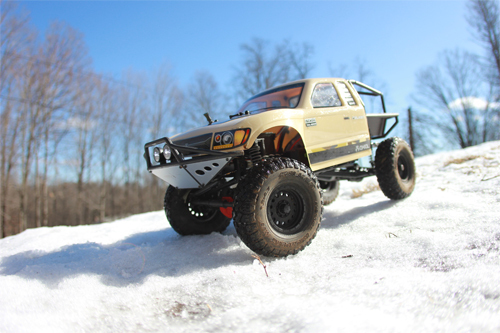 Scale Builders Guild is known for its unique view on the scale and trail community and they took that talented perspective to Axialfest in 2015 to capture some amazing moments. Plenty of action footage was packed into this video and covers all of the special events and terrain you can tackle with your rig. This video takes a good look at the rough terrain your rig can encounter at Cisco Grove and of course the fun you can encounter with the people who attend. Sometimes it good to look back, way back. This is a look at Axialfest back in 2013 and if you watches the videos above you’ll see some changes in format, but many other things are still common. The love for Axial, friendships, custom built trail rigs, amazing adventures and most importantly the appreciation for the fans. There are plenty of thrilling moments and messages in those videos. What it’s like to be a part of the Axial lifestyle; to eat, sleep and then work or drive your Axial rig day in and day out. To seek out people just like you who love Axial, who want to build great things, to express yourself through a moving model that will turn heads and then have those people approach you to talk more about your passion. 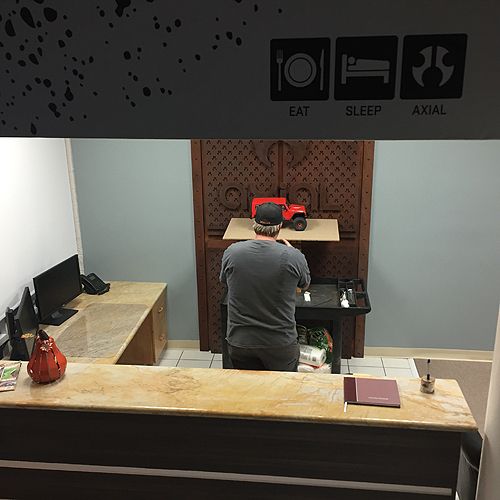 At Axialfest everyone is there to be appreciated by the company Axial, but everyone there appreciates each other for having the same love for Axial radio control vehicles. 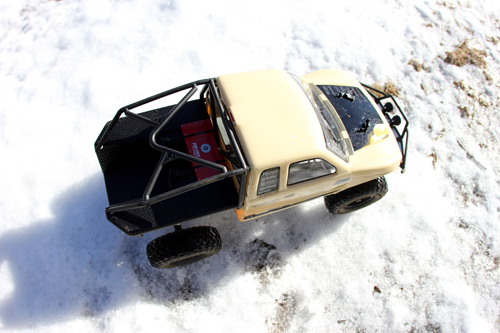 Just because it’s cold, wet, snowy, icy and sometimes just miserable weather doesn’t stop the majority of Axial drivers from getting their RC drive on. All of those conditions can translate to a lot of fun, cool photos and great stories to talk to your trail buddies about. But after your four-wheeling trek across the frozen tundra of your backyard or weather beaten nearby park, you need to give your machine a little TLC in order for it to continue to run at optimum performance. Here we’ll go over the key areas to focus on to check and maintain. Before we dip into the checks and techniques to maintaining your machine, there is one running situation we’d suggest you avoid when running your car in snowy conditions. This harmful situation for your machine is running in an area where salts and chemicals have been used to melt the snow. Sure a slushy parking lot four-wheel drive donut session sounds fun, but the salts or other ice melting chemicals mixed in with that slush can accelerate the corrosion of metal parts and even eat away at some finished plastics. Try to stay away from the tempting slush slides and if you do push the limits and put your rig through a salt bath, be certain to follow the cleaning and maintenance steps we’re about to outline. There is one thing to remember when running in any type of wet conditions, water goes anywhere it wants. So when running in water, your hardware, screws, nuts, pins, bearings, shafts, any metals are subject to getting wet and rusting or corroding. Each and every metal on your car should be inspected and addressed if necessary in order to prevent a problem. 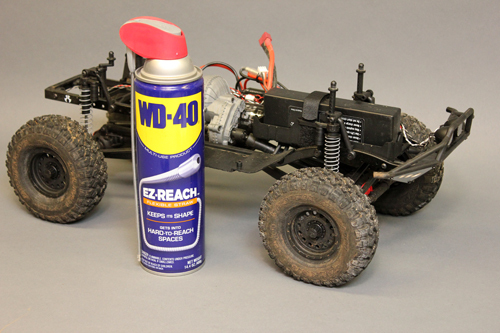 One of the first things many suggest to do to an RC car that is covered in water is to immediately spray as many metal parts and hardware as possible with WD-40 to combat any corrosion that is immediately setting in. Although WD-40 is known as a rust inhibitor, it should not be your only mode of defence. If possible, you should also blow your rig off with air, blow every last little area on the machine, an air compressor with some decent pressure would be the best here, but smaller blowers or in the worst case, a hair dryer would work too. Hardware- Screws, nuts, pins, screw pins and so on are obvious. However you can live it a little rust on these, there won’t be any performance or wear issue if most of these are not treated. The few items to watch though are the screws and sleeves in caster blocks. Rust here may cause issues later. Axle shafts are another area. Rust can build up and often make it difficult to remove from support bearings. 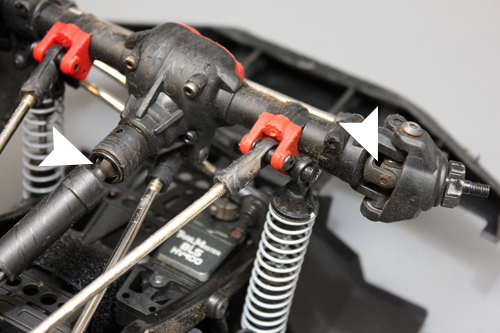 Universals- If your rig is equipped with universal driveshafts in the front axles, do yourself a favor and keep them dry and lube them or WD-40 them after wet use. 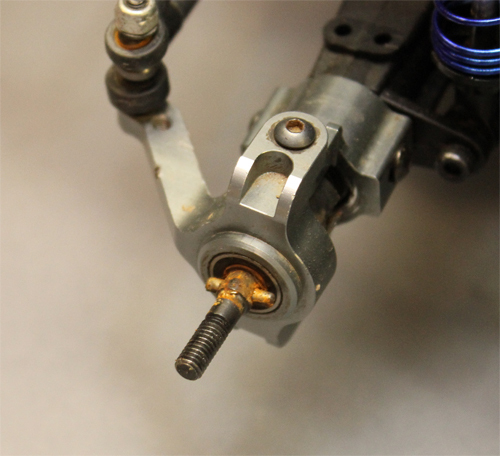 It is even a good idea to pick the rig up and give the vehicle some throttle while blowing off the components or spraying them with a rust inhibitor to get water out and get the inhibitor into the moving parts. Water sitting in there will cause rust later. 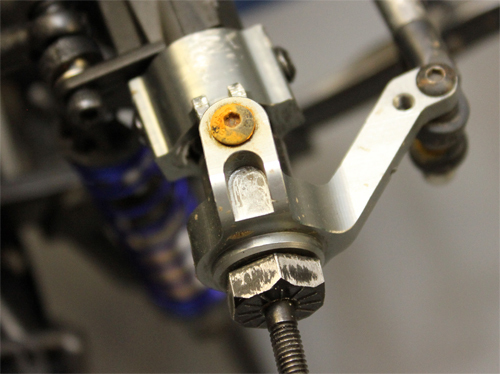 Your universal joints in your rigs center shafts should get the same treatment. Bearings- Getting water out of your bearings is no easy task. If you submerge your rig, water will get in the bearings. Do your best to blow out the bearings with air, blast them with an cleaning spray like a motor spray and then with WD-40. Picking your vehicle up off the ground and running your driveline to help expel water is a good idea too. 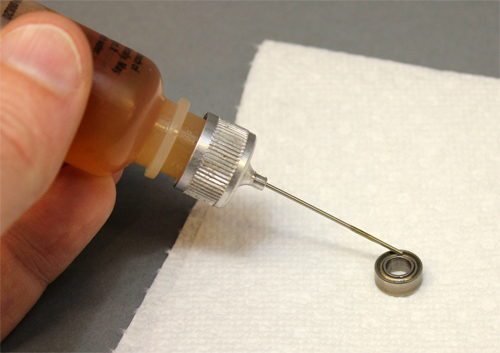 Once you feel you’ve done your best to get the water out, use a micro oiler to re-oil the bearings. Gears- Depending on the gears you use, metal or aluminum, are subject to problems caused by water. Use a paper towel or any of the previously mentioned methods to dry them off and then be sure to coat them with a generous amount of grease for extra protection. Electronics- Just because your electronics are weather-proof, water-resistant and whatever doesn’t mean you should put them away wet. It’s always a good practice to dry them off with towels or compressed air just as a extra precautionary measure to make certain nothing happens to these expensive components. Tire foams- If your tires are vented and you’ve run in water, you need to do your best to get the water out. If you are running beadlocks, it would be best to pull your rims apart, take the foam out and dry them off by compressing them in dry towels. If your tries have been glued to the rims, try squeezing as much water out as possible and place the tire in a warm place to allow water to evaporate. If the hole in the tire can be place down, do so so water can drain out of the tire. Batteries- If your battery gets wet, take the time to shake out any water and blow off water with compressed air. Always use caution when handling batteries. No doubt driving in wintry wet weather is fun, but proper maintenance afterward is time consuming. If you’re the type that loves maintenance or doesn’t mind the work after the occasional slush splash, then go for it, have fun. The worst case is, you may need to replace your bearings with a new set from Axial or a trusted bearing supplier like Team Fast Eddy Bearings. If rusty screws are not your thing, you can take a look at aftermarket screw sets like those from Team KNK. 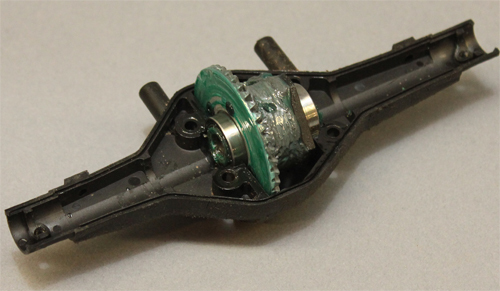 Keep an eye on those driveshafts and gears, they are a more costly item to replace. Take the time to maintain your rig and it will last you a long time, no matter what type of environment you run it in. RETAIL IS OPEN FROM 09:00AM DAILY TILL WE’RE DONE! GO OUT IN THE DESERT AND WATCH THE FULL SIZE RIGS GO FOR BROKE FOR THE COVETED TITLE OF “KING OF THE HAMMERS” 2018!